Home › Celebrity › Joe Rogan Net Worth: Does He Make $10M Per Year? Joe Rogan Net Worth: Does He Make $10M Per Year? Stand-up comedian, actor, mixed-martial arts commentator, host, and jiu jitsu black belt are just a few of the labels attributed to Joe Rogan. From his initial acting role as Frank Valente on Hardball in the early 1990s, Joe Rogan has gone on to amass a fortune estimated to range between $25 million and $30 million. 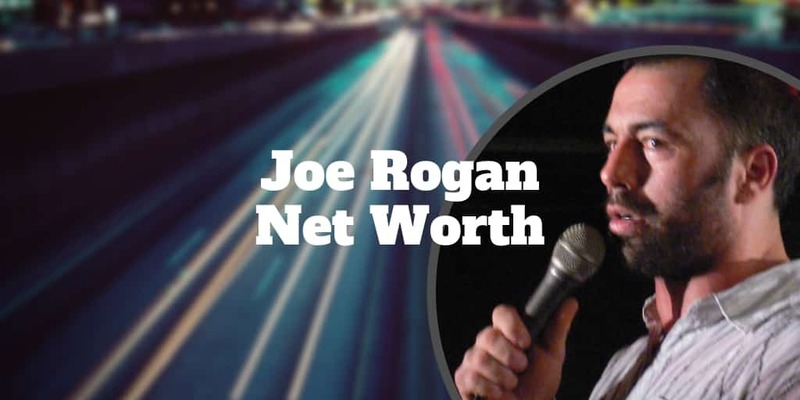 Some Joe Rogan net worth estimates are even higher because his JRE Experience podcast is believed to net him approximately $30,000 per episode and as many as five episodes per week are produced. Even at a rate of 4 per week all year and factoring in a couple of weeks off for vacation, he may be pocketing close to $6,000,000 annually solely from the Joe Rogan Experience podcast. And that doesn’t account for his salary earnings from his role as UFC commentator or his earnings as a stand-up comedian where he regularly sells out to packed auditoriums. His Netflix 1-hour comedy specials have also likely netted him big chunks of change. It’s very possible that he is earning $10,000,000+ per year which would mean net worth estimates of $30 million are likely underestimating his true wealth. Rogan has featured in comedy classics like The Man Show, Chappelle’s Show and Last Comic Standing. He’s also had a storied career on TV, featuring in hit shows like Silicon Valley and hosting Fear Factor. But his longest lasting career gig may be his stand up comedy, where he sells out shows to packed theaters across the country. Some of his best comedy specials include Joe Rogan: Talking Monkeys in Space Joe Rogan: Rocky Mountain High, and Joe Rogan Live. The Joe Rogan Experience is one of the most successful podcasts of all time, featuring over 2,500,000 subscribers. Each episode typically receives hundreds of thousands and sometimes even millions of views, an astonishing feat considering new episodes are produced almost daily. It highlights what a loyal following of listeners he has attracted that they regularly tune in. So what makes the Joe Rogan Experience podcast so good? Each podcast is a surprise for one thing. Some days you might hear Mel Gibson discuss stem cell therapy while on other days Neil deGrasse Tyson shares his views on the Universe and life as we know it. Generally, Joe Rogan podcast episodes feature comedians, mixed-martial artists and coaches, celebrity friends, and political commentators or personalities. For example, comedians who regularly feature include Joey Diaz, Bill Burr, and Ron White. Personalities in the mixed martial arts world include Eddie Bravo, Jeff Novitsky, Pat Miletich, Tyron Woodley, George St. Pierre, Brendan Schaub, and Stipe Miocic. And in the political or current affairs domain, long-time friend and conspiracy theorist, Alex Jones, has come on from time to time as have controversial personalities like Milo Yiannopoulos, Ben Shapiro, and former Minnesota governor Jesse Ventura. The Joe Rogan Alex Jones podcast remains the most popular of all time so far with over 5 million views and counting. Many of the episodes feature musings about life, humanity, and the Universe. For example, you will hear Joe and his guests refer to ethnobotanist and mystic, Terence McKenna, who was famous for sharing his experiences taking psychedelic drugs. Rogan has sometimes landed in hot water over his own discussions about cannabis and use of drugs. But he doesn’t shy away from it and even describes himself as a psychedelic adventurer which stems from his past experiences with the psychoactive compound, DMT. Rogan’s interest in mixed martial arts and in particular jiu jitsu was sparked when he watched the famous Brazilian martial artist, Royse Gracie, fight at UFC 2. Rogan was fascinated to see Gracie defeat much larger men by using jiu jitsu submissions. Soon afterwards, he became a UFC (Ultimate Fighting Championship) interviewer but his deep understanding of martial arts catapulted him to the role of UFC commentator, a position he has held since 2002. Most UFC promos feature Rogan’s enthusiastic commentary but he usually only commentates on UFC PPV (pay-per-view) events. He is no slouch when it comes to mixed martial arts himself. At 14 he took up karate and by 19 he had won a US Open Championship tournament as a lightweight. He was a full-contact state champion for 4 consecutive years in Massachusetts and even became an instructor. Rogan earned his black belt in jiu jitsu under Eddie Bravo, who is the founder of 10th Planet Jiu Jitsu, which has over 100 schools worldwide. In 2008, Joe met his future wife Jessica Schimmel. Together they have a daughter, and Joe is also the step-father to Jessica’s daughter from a previous relationship. You won’t hear or see much about them as Joe generally keeps his family life private. What we do know is that together they live in Bell Canyon, California in a 7,500+ square foot house that cost him approximately $2.2 million in 2003. Frequently, Joe mentions that he runs in the mountains and has attracted some controversy as a bowhunter. He said the reason he took up hunting was because he had to choose between becoming vegan or hunting meat himself. Due to issues he had with mass produced farming, he couldn’t support the mass meat industry. He claims that he couldn’t survive without meat so he decided to become a hunter. In interviews, he has shared that he hunts for all the meat he consumes and practices with a bow and arrow every day to improve his target accuracy. Follow news on the Joe Rogan Twitter account and updates on his Joe Rogan Instagram account. >> Billion Dollar Fight: Conor McGregor Vs Floyd Mayweather? ‹ How Does Credit Card Interest Work?